Investing in value companies can be effectively through stock mutual fund or equity mutual fund. One of the fund category is mid cap value mutual fund. These types of fund usually invest in under value mid size companies which have $2 billion to $10 billion market capitalization. The advisor will look for stocks that are cheaper or growing more slowly than typical market. These companies usually come from energy, financial, and manufacturing sectors. 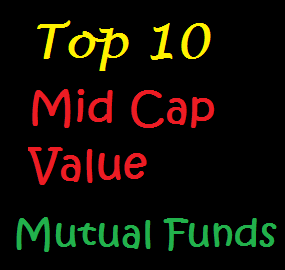 The Top 10 Mid Cap Value stock fund of 2010 is ranked based on the fund performance in 2010. The fund also has more than $300 million net asset. The fund may include funds from variety of fund family like Neuberger Berman (Allianz Global Investors), MFS Investment Management, AllianceBernstein Investment, Fidelity, Goldman Sachs, JPMorgan, etc. 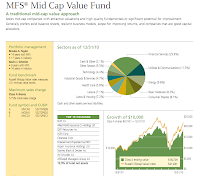 This mid cap value mutual fund is managed by Alexandra S. Pomeroy since Oct 7, 2006. The annual expense ratio of this fund is 1.16%. This Neuberger Berman fund has returned 15.58% over the past one year and 5.16% over the past three years. The minimum balance to invest in this fund is $1,000 for either brokerage or IRA account. The other class tickers of this fund are NBHCX, NBHIX and NBHRX. Among all, NBHIX has the lowest expense ratio (0.8%). Top 10 holdings of this fund are Foster S Group (1.9%), CenterPoint Energy (1.9%), Cenovus Energy (1.9%), AMB Property (1.9%), Blackrock Inc. (1.8%), Sanofi Aventis (1.8%), Crescent Point Energy (1.8%), Bonavista Energy Trust (1.8%), Franco Nevada (1.8%) and Total SA (1.7%). MFS Mid Cap Value fund objective is to seek appreciation of capital. The major net assets investment of this fund is in equity securities. Normally, this fund invests >80% of its total assets in issuers with medium market capitalizations as stated in the range of the Russell Midcap Value Index. There is a probability of this fund to invest in either foreign securities or derivatives. Kevin J Schmitz has managed this mutual fund since Nov 20, 2008. This fund has 1.25% expense ratio per year. This fund has returned 3.81% over the past three years and 2.62% over the past five years. The minimum balance to invest in this stock mutual fund is $1,000 for brokerage account and $250 for IRA account. This fund can be purchased from 87 brokerages, such as Morgan Stanley Advisors, Pershing FundCenter, Td Ameritrade, Inc., JPMorgan, Merrill Lynch and Edward Jones. The other class tickers of this fund are MCBVX, MVCCX, MCVIX, MVCGX, MCVRX, MVCHX and MVCJX. Some classes have lower expense ratio and different minimum investment. As of January 2011, the top 10 holdings of this fund are NVR Inc., Allied World Assurance Co Holdings Ltd, QEP Resources Inc., AON Corp, Celanese Corp, Entertainment Properties Trust REIT, Aspen Insurance Holdings Ltd, Stanley Black & Decker Inc., JM Smucker Co and Affiliated Managers Group Inc. These top 10 holdings make up of 13.9% of total net assets. The investment in Allianz NFJ Renaissance is looking for capital growth in long-time period as well to produce income. The major net assets investment is in common stocks of attractive-valuations-trading companies. This PQNAX fund may invest around 25% in non U-S securities and 20% in REIT. There is also chance of investing in other kinds of equity securities, including warrants, convertible securities and preferred stocks. The minimum balance to invest in brokerage account of this domestic stock fund is $1,000. There is no IRA account available. This fund can be purchased from 102 brokerages include E TRADE Financial, Morgan Stanley Advisors, Pershing FundCenter, TD Ameritrade, Inc. and Merrill Lynch. The other class tickers of this fund are PRAAX, PQNBX, PQNCX, PREDX, PRNIX and PRNRX. Only PRNIX has no 12b1 fee and no sales load. 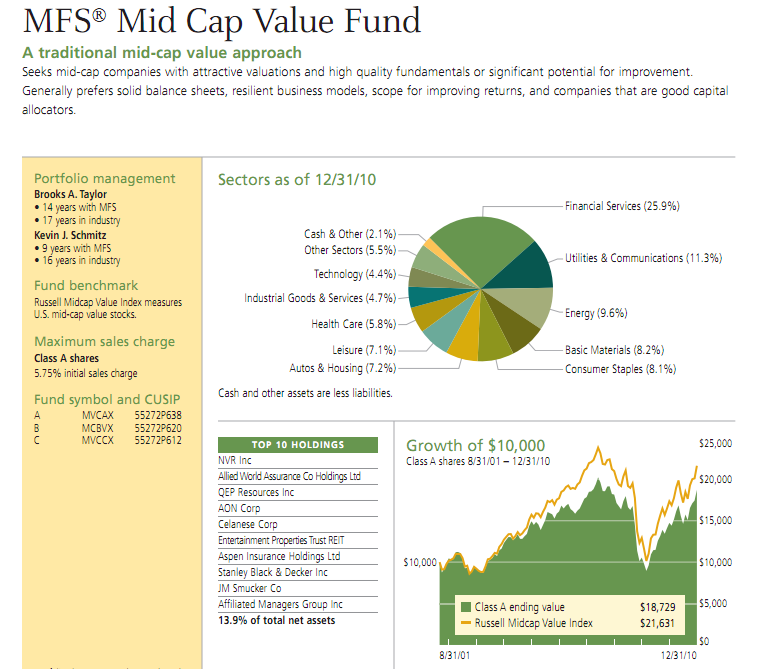 The top holdings of this mid cap value fund as of Feb 28, 2011 are Tidewater Inc. (1.29%), Nexen Inc. (1.23%), Noble Corp (1.22%), Valero Energy Corp (1.17%), Cliffs Natural Resources Inc (1.15%), VF Corp (1.15%), Yamana Gold Inc. (1.13%), El Paso Corp (1.12%), Nyse Euronext (1.12%) and Loews Corp (1.12%). 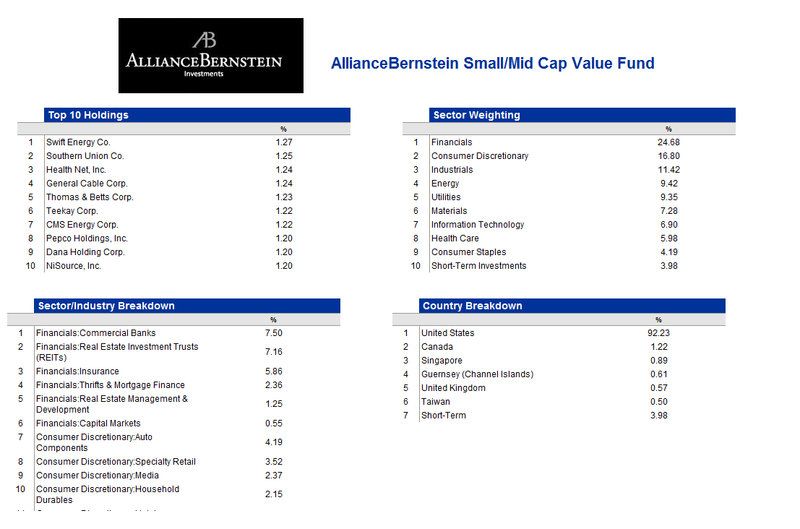 AllianceBernstein Small-Mid Cap Value investment is looking for long-term capital growth. The majority net assets investment is in securities of small- to mid-capitalization companies. It invests in a diversified portfolio of equity securities 60 to 125 U.S. companies. Since 2002, Joseph G. Paul has been the lead manager. This AllianceBernstein fund has 1.15% annual expense ratio. There is a 0.30% 12b1 fee and 4.25% of front end sales load. The minimum balance to invest in this fund is $2,500 for either brokerage or IRA account. This fund can be purchased from 109 brokerages include Scottrade Load, Merrill Lynch, CommonWealth PPS, Edward Jones, Fidelity Retail FundsNetwork and Schwab Institutional NTF. This fund has returned 22.87% over the past one year. The other class tickers of this fund are ABSYX, ABBSX, ABCSX, ABSIX, ABSKX and ABSRX. Some classes have lower expense ratio and no 12b1 fee. And these other classes have no front-end sales load. The top 10 holdings of this fund are Swift Energy Co. (1.27%), Southern Union Co. (1.25%), Health Net, Inc. (1.24%), General Cable Corp. (1.24%), Thomas & Betts Corp. (1.23%), Teekay Corp. (1.22%), CMS Energy Corp. (1.22%), Pepco Holdings, Inc. (1.20%), Dana Holding Corp. (1.20%) and NiSource, Inc. (1.20%).